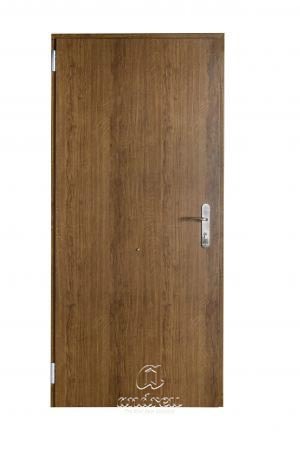 Safety door to modern design, without embossing, of one or two leaves, with up to 5 closure points. 53mm thick leaf, assembled with two 1mm steel plates. Security lock embedded with anti-drilling shield on the outside. Possible lock at 1, 3 or 5 points. 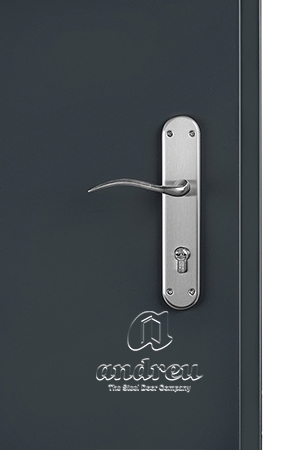 It has 2 steel hinges with nickel finish adjustable in 3 directions, and 2 anti-crow bar bolts. 1.5mm thick CR8 frame incorporates rubber seal to ensure a smooth and airtight closing and a system to screw the door either to a specific sub-frame, or directly to work. All this gives the door high mechanical strength.